Metalforming and drawing processes can consume large amounts of press energy, due to their long working distances. For example, pushing 50 tons of force through 1 in. of forming requires 50 in.-tons of energy. On the other hand, pushing 50 tons of force through 3 in. (deep drawing) of that same material requires 150 in.-tons of energy. And, changing to a material that is two times stronger—DP 980 steel, for example, compared to HSLA 350—requires 100 tons of force working through the same 3-in. distance and a press that provides at least 300 in.-tons of energy. Fig. 1—Energy curve for a flywheel-driven press. The table above provides the tonnage and energy-capacity ratings of four sizes of mechanical presses. Many metalformers, when communicating with their tooling suppliers, do not include energy capacity in their specifications, even though that information is readily available in the press manufacturer’s manual. 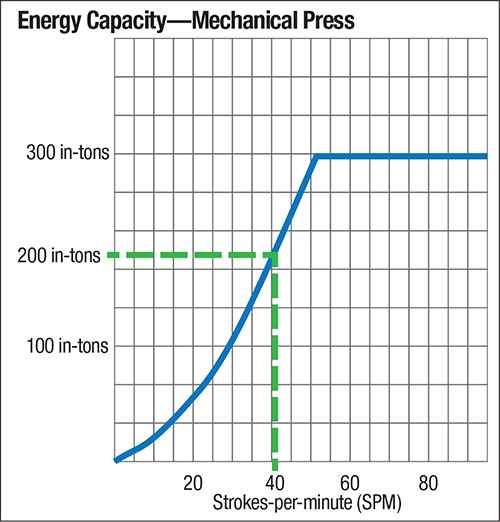 The omission of press-energy capacity can result in improper press selection, especially for deep-drawing applications. The primary differentiator among the mechanical presses specified in the table is their drive systems. Nongeared presses do not use gear trains or gear reductions to transmit torque to the crankshaft. Rather, a v-belt and pulley arrangement connects the end of the motor shaft to the flywheel. The speed of non-geared presses generally is quite high in order to maintain flywheel energy. Mechanical presses intended for deep-drawing applications use gear trains in a single- or twin-drive arrangement, coupled with single- or double-gear reductions. Adding a gear train allows for an increase in torque (press energy). Notice that the energy data for each of the machines listed in the table relate to a specific press speed. Fig. 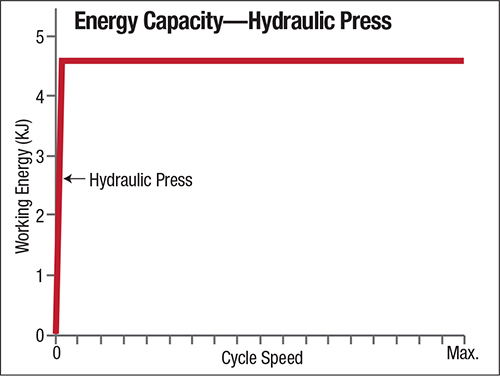 2—Energy curve for a hydraulic press. Stamping higher-strength steels, when compared to mild steels, requires much higher blankholding and punch forces, resulting in increased frictional forces and interface temperatures. When interface temperature reaches a critical point, lubrication breakdown and other forming- and die-related problems can arise. During a production run, it would not be uncommon to reduce the press speed to lower the process operating temperatures and avoid thermal-related forming problems. However, when press speed drops below a critical point, the available energy can rapidly diminish (Fig. 1). To address energy-related problems with deep-drawing operations, especially with higher-strength materials, metalformers should consider the benefits of servo-driven mechanical presses. These presses employ high-capacity servomotors in place of the flywheel, motor and clutch/brake system of a conventional press. A servo-drive press can provide full energy and constant torque even when speed is slowed to 1 stroke/min., similar to that of a hydraulic press (Fig. 2). Other advantages of servo-drive presses include the ability to program stroke and slide velocity and to dwell anywhere in the stroke (including bottom-dead center) without energy loss.